Do you spend too much time creating quotes and proposals? QuoteWerks is the market leading sales quoting and proposal solution that automates your sales process from start to finish. QuoteWerks is specialized (CPQ) software used in every industry for creating sales quotes and proposals. Rather than using Microsoft Word or Excel to create your quotes and proposals, you can benefit from a tool that is specialized for the task of creating quotes and proposals. DataLink: When QuoteWerks pulls the contact information into your quote, its innovative DataLink feature can automatically include other information such as terms, sales tax rate, customer profile, and more. Custom Designed Profiles: Let QuoteWerks determine the appropriate pricing a particular customer should receive based on your pre-specified criteria. Built-In Visual Layout Designer: Personalize your print layouts with the built-in visual layout designer. Our advanced print layout designer allows you to easily insert data fields from your contact manager into the print layouts. Then, when you print the quote, QuoteWerks will pull data from the contact manager fields that you specified resulting in a printed quote that includes information from your contact manager contact record. Web-Linked Pricing Guides: Create and maintain your own products database and import product information from files that your vendors provide. 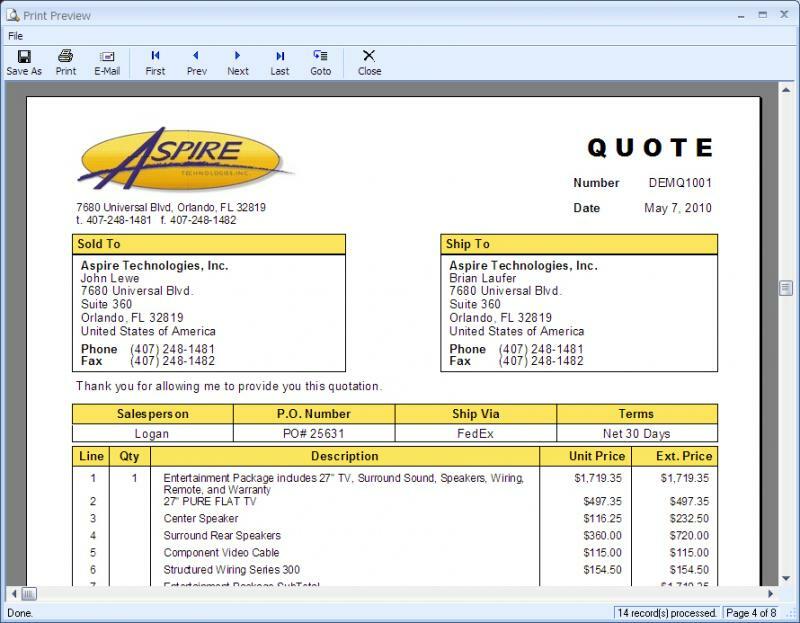 For example, if you are in the PC industry, you can link QuoteWerks Professional Edition directly to the offline product price guides of IngramMicro and TechData… no importing required! Setup products to have required, optional and substitute products. Products can also be organized visually in folders to speed up quoting. Optional link to QuickBooks accounting software to convert quotes into QuickBooks invoices. Optional link to Peachtree accounting software to convert your quotes into Peachtree purchase orders, sales orders and invoices. Optional “Open Export Module” to export quotes/orders to a delimited text file format that many accounting packages can import (Great Plains accounting for example). Multiple-user network versions available, allowing users to increase productivity by sharing information in the quote database. Mark was instrumental in our upgrade to the latest version of GoldMine. Not only did Mark do the data conversion but he has subsequently resolved several issues that have surfaced with the GoldMine alarms & the daily backup process. Mark has been very accommodating to any contact I have made to either ask questions or resolve an issue. Previously we have worked with Bob thru the years to support our GM application and again very pleased with the support offered by Bob. I would highly recommend W-Systems Corp. for support. CRMs are personal and complicated. With every project and every issue we have had, I feel that we were treated fairly and professionally. On the occasional misunderstanding or miscommunication, there was no gotcha but a desire to solve the issue fairly. The expertise level is high. Very good and respectful service. W-Systems installed our system and has been wonderful about working with us over a long period of time when something went wrong. The entire team at W-Systems works hard to make sure you are satisfied with their service - be it resolving technical issues or implementing new technologies! BIG thumbs up!